A new practice improvement initiative and study indicates active shooter training and simulations are vital to ensuring staff is equipped to respond effectively should their emergency department ever become a target for such an act of violence. The goal was to develop and successfully implement a safety strategy that increased the ability of a large pediatric emergency department staff to effectively respond to an active shooter in their hospital. The corresponding survey results, set to be published online in the Journal of Emergency Nursing on Aug. 27, show that out of 202 emergency nurses and ancillary staff members who participated in active shooter training, 92 percent felt better prepared to respond if a shooting occurred at their facility. Additionally, 70 percent of participants reported an increase in knowledge and readiness. "We are in the infancy stage of this conversation," study co-author and Emergency Nurses Association member Mary Baker, BSN, RN, said of active shooter training in hospitals. "As emergency nurses, we practice our ACLS and PALS a lot. We've gotten very proficient at it because it's always top of mind. But when it comes to preparing for a catastrophe such as an active shooter in our own emergency department, most nurses have no idea how we'd react because we aren't preparing for it." Active shooter situations and mass casualty incidents have become an unfortunate and increasing reality in society today. That has put emergency nurses on the front line of caring for victims of mass casualty incidents, but also on alert for the possibility their facility could become part of a large-scale disaster or tragedy. Due to the complexity and potential devastation of such an incident, it is critical for emergency nurses to be prepared. ENA knows it is vital for emergency nurses to regularly engage in active shooter training and mass casualty preparedness. 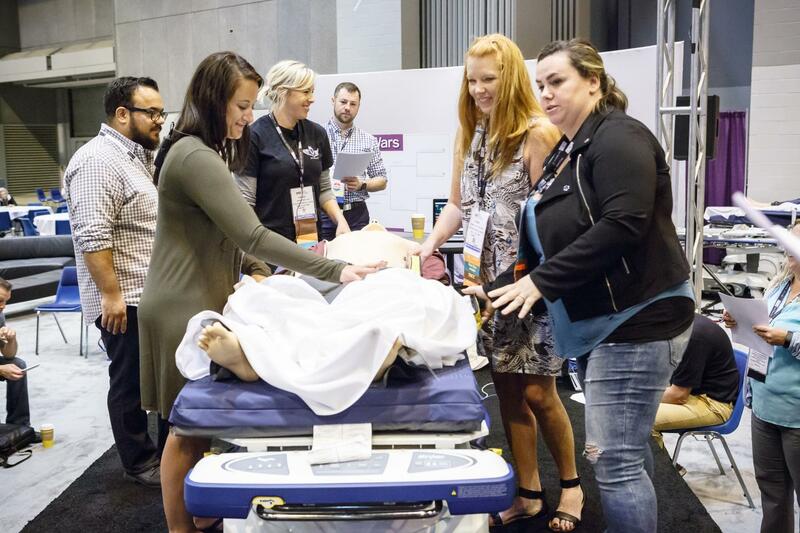 To further prepare emergency nurses for their role in those scenarios, ENA is offering multiple opportunities for emergency nurses to participate in readiness courses and activities at Emergency Nursing 2018 – ENA's annual national conference dedicated to the emergency nursing profession occurring Sept. 26-29 in Pittsburgh, Pennsylvania. MCI Escape Room: Participants work as emergency nurses in a small community hospital emergency department with limited resources. After a brief description of the disaster, attendees will be broken into groups of five to quickly go through stations, solve clues and demonstrate skills needed for a variety of patient scenarios in a mass casualty incident or other disaster. "Game of Thrones": Attendees can compare make-believe traumatic injuries from the hit HBO series "Game of Thrones" to real-life traumatic injuries caused by modern threats to provide today's emergency nurse an opportunity to correctly identify these injuries and learn the proper course of treatment. DisastER: Check out the 35-foot helicopter at the center of the exhibit hall and listen to ongoing presentations from Air and Surface Transport Nurses Association on topics such as transport after a mass casualty. State of Emergency – How We Prepared for Richard Spencer: Wendy A. Swan, director of emergency services at University of Florida Health, describes how a Level I Trauma Center and emergency department prepared for a radical speaker, and the potential influx of thousands of associated supporters and counter protesters. For more information on these mass casualty readiness activities or to register for Emergency Nursing 2018, visit https://www.ena.org/events/en18. The event is made possible thanks to ENA strategic partners Teleflex and Stryker, and many others, who support and value the future of emergency nursing. The Emergency Nurses Association is the premier professional nursing association dedicated to defining the future of emergency nursing through advocacy, education, research, innovation, and leadership. Founded in 1970, ENA has proven to be an indispensable resource to the global emergency nursing community. With more than 43,000 members worldwide, ENA advocates for patient safety, develops industry-leading practice standards and guidelines, and guides emergency healthcare public policy. ENA members have expertise in triage, patient care, disaster preparedness, and all aspects of emergency care. Additional information is available at http://www.ena.org.